Have you ever been to Hawaii? For those of you who said yes, have you ever been to an island other than Oahu/Honolulu? When I was younger my mother took me to Honolulu on a work trip. I loved it! I thought it was paradise….until Tim and I visited the island of Kauai. Last year over memorial day weekend Tim and I went to Kauai. The island is an amazing botanical garden filled with lush vegetation as far as the eye can see. The island has big beautiful waterfalls everywhere and is an outdoor enthusiasts paradise. Flight prices over Memorial Day weekend are also normally affordable (for Hawaii). Drive up Waimea Canyon State Park, great views, nice hike and rainbows everywhere! Na Pali Coast: by helicopter or by boat, either way it’s breathtaking. 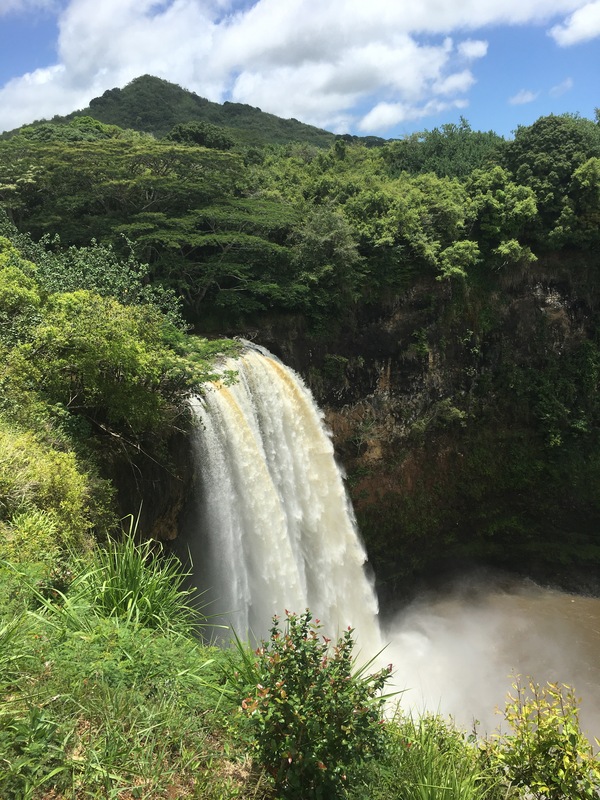 Wailua Falls: a quick drive from the airport to see a very powerful waterfall. If you want to have fancy dinner, visit Merriman’s Fish House or Tidepools at the Hyatt. Grab a drink just before sunset at the Beach House. It’s a famous waterfront restaurant. The food was good, but the view was awesome. Or try a low key spot like Bamboo Café: It is in the shopping center next door to the Marriott Beach Club and Duke’s. We loved their giant pineapple macadamia nut pancakes and fried rice with breakfast. So yummy! If you are staying at a resort that has grills, drive to Costco and buy Kauai Shrimp. Seriously the best grilled shrimp in the world! We would fly back tomorrow just for the shrimp. Costco is also where you should buy your chocolate covered macadamia nuts, etc to bring home. Lastly, to appreciate the prices here on the mainland, visit a grocery store. When you see that a half gallon of regular (not organic) milk is $9, you may stop whining about the prices at Whole Foods. Oh and last but not least, eat poke….it’s delicious and cheap everywhere!! Hmmm, when are we going back? Till next time!